Alan Archibald Campbell-Swinton 1863 - 1930. Although born at 9 Albyn Place Edinburgh on 18th. October 1863 to Archibald Campbell Swinton younger of Kimmerghame and Georgina Caroline Stewart, Alan Archibald Campbell-Swinton has nevertheless every claim to be a 'Dinger' being brought up and spending much of his early years at the family ancestral home at Kimmerghame House just south of the Town. As a schoolboy he attended Cargilfield Trinity School in Edinburgh before moving on to Fettes College. It is recorded that he absolutely detested school and left without any qualifications whatsoever. This was probably very largely due to the fact that Fettes College at the time provided very much a classical education whereas Campbell-Swinton's inclinations were very obviously to matters technical and scientific. It is also recorded that he hated sports of all sorts. However it was at Fettes that he developed a keen and life long interest in photography and at age fifteen and only two years after its invention by Alexander Graham Bell he linked two houses in Edinburgh by telephone. After leaving school and a postgraduate year touring France in 1882 he began an engineering apprenticeship in the Newcastle works of William George Armstrong of Cragside with whom, notwithstanding a substantial age difference, he came to form a close working relationship and during this time he worked on and developed a new method of insulating electric cables on board ship by encasing them in lead. In 1887 on completing his apprenticeship he moved to London setting up his own electrical consultancy business where he started experimenting with, among other things, X-rays. X-rays (then known as new photography) had been discovered by Wilhelm Rontgen in January 1896 but a week later Campbell Swinton had managed to replicate the work and indeed the first X-ray in Great Britain was taken in his laboratory. This 'new photography' occupied his interest for several years, developing better X-ray tubes and investigating the properties of X-rays and electronic beams. At this time he was working with Guglielmo Marconi, an Italian with Scottish and Irish ancestry, who is generally credited with the discovery of wireless telegraphy. Marconi has just moved to London and it was Campbell-Swinton who introduced him to William H. Preece, engineer in chief of the Post Office. Probably fortunately for Swinton, as the dangers of X-Rays were not fully appreciated, and many suffered from over exposure Swinton rather fell out with his partners and dissolved the company. In 1897 he was working on steam turbines and was one of the crew which gatecrashed the Spithead Review to mark Queen Victoria's Diamond Jubilee, the ship which he was helping crew "The Turbinia" reaching a speed of 34 knots compared to the top speed for destroyers of the day of 27 knots. The success of the Turbinia was to lead to the development of the turbine system. His work with X-rays caused him to start giving consideration, sometime about 1903/04, to the idea of a practical method of television. At the time there were perhaps two competing concepts probably predominately the idea of distant hearing i.e. pictures via the telephone though also distant vision - pictures via a radio transmitter. Some correspondence ensued in the scientific journal "Nature" and in June 1908 Campbell Swinton who was much more persuaded by the latter published an article for Cathode Ray Tube based electronic television. This was the system of television that was subsequently developed and became the standard until very recent times. In 1912 in a lecture to the Rontgen Society he presented a diagram of his proposals which was published in their Journal. There may be competing claims, as simultaneously but quite independently, a Russian scientist Boris Rosing was developing a similar system in St. Petersburg and patented the device in Great Britain in 1907. His however is generally considered, even by the Russians, as a limited and inferior version and the true credit for using a Cathode Ray Tube device for imaging must belong to Campbell-Swinton. Unfortunately Campbell-Swinton did not patent the idea and the importance of his input into the conception of television has probably never been given its full proper credit not only because of his failure to patent but also because of a natural inbuilt reticence to promote himself and also because many of his papers were destroyed either in the fire at Kimmerghame in 1938 or were lost when his London house was bombed during the Second World War. In 1915 Campbell-Swinton's work was recognised by the British scientific fraternity when he was elected a Fellow of the Royal Society an honour in which he took great pride and during the 1920s his ideas for television were widely published throughout the world. At this time though there were also being promoted in Great Britain ideas for an electo-mechanical system particularly so by John Logie Baird. Such a system was restricted in the extreme and Campbell Swinton wrote strident criticisms to The Times and professional journals and especially to the BBC management who were being pressurised by Baird for transmission facilities. Campbell-Swinton died of pneumonia in 1930 aged 66. However n in 1936 when the world's first television service was opened in Britain it based very squarely on the concepts which he had laid down rather than the much inferior and probably impractical mechanical option promoted by John Logie Baird. There was probably not one 'true' inventor' of television but rather several working all in the same field who all contributed but if credit is to be assigned to one man it must surely be to 'Dinger' Alan Archibald Campbell Swinton. 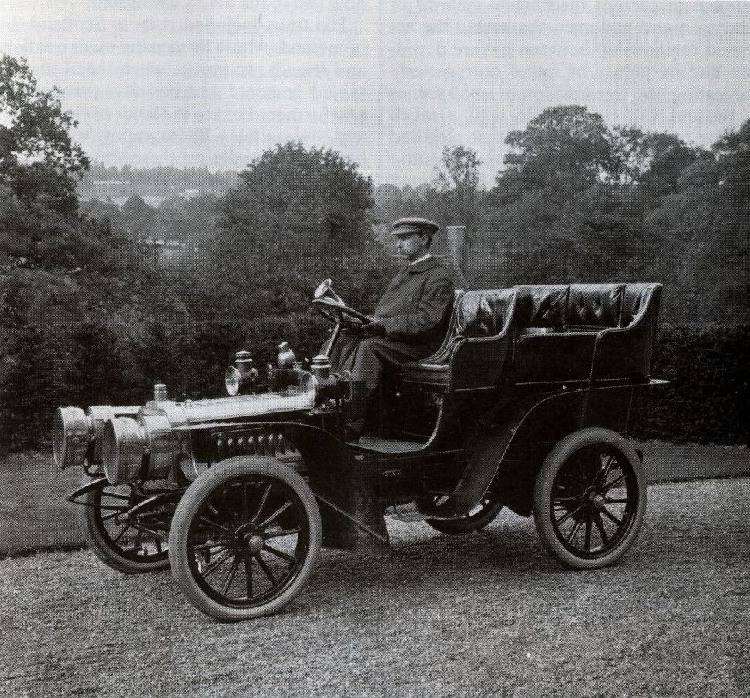 Right an image from 1903 showing him at the wheel of an early Talbot. Much of the above is taken from a paper "One hundred years of All-Electric Television by Dr. Paul Marshall" to whom we are much indebted and a copy of which has been very kindly donated to the Society archive. The foregoing is only a very brief summary and needless to say the paper goes very much more into the background to the invention and compares the competing claims of the alternative systems in very much more specific scientific detail. 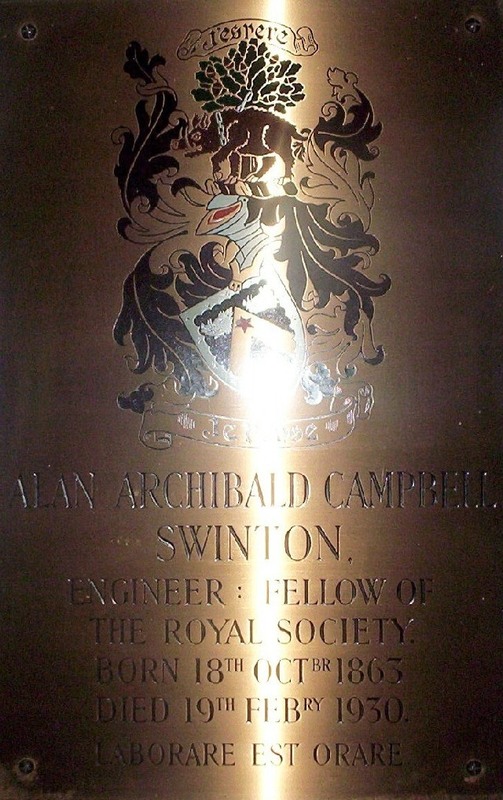 Dr. Marshall gave a fine talk to the Society in September 2012 on the life of Alan Archibald Campbell-Swinton and demonstrated the undoubted superiority of the system propounded by Campbell-Swinton over that promoted by John Logie Baird.